Writing a novel is a more calculating form of creativity, as historical research prompts my imagination to recreate the social and political (and criminal) world of Ancient Athens and the sort of people who may well have lived there. What emerges is what an exciting place Athens must have been with all the radical spirits, innovators, creative minds gravitating to this vibrant centre - people like Herodotos (first historian), Hippodamos (first town planner), Artemon (early engineer) not to mention Perikles' think-tank of philosophers, playwrights, musicians and others, including the beautiful and intelligent Aspasia, his mistress and wife. Quite quirky characters, too. Just to think that they were thinking out so much and doing so many things for the very first time ever! 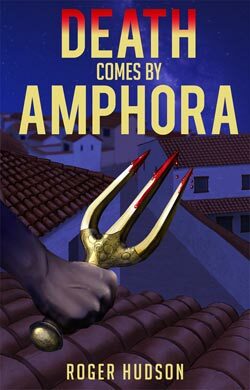 Historical mystery novel set in Ancient Athens introducing 18-year-old Lysanias and his aging but up-for-it slave Sindron. Murder. Assassination. Revolution. Not what Lysanias expected when he answered his uncle Klereides’ call back to mighty Athens to join the family business. His duty, as heir, is to investigate Klereides’ mysterious death, find the killer and exact vengeance. But he has no-one to trust, except his elderly slave, Sindron. Their investigations take them deep into the murky worlds of Athenian politics, business and art, where Klereides had many enemies,and where even his friends cannot be trusted. 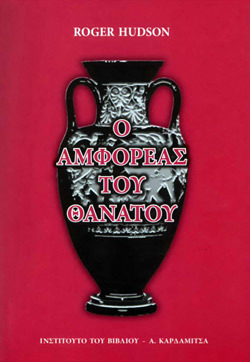 Embroiled in a power struggle between aristocrats and workers, Lysanias finds his loyalties torn. He is from an aristocratic family and his hero, the great General Kimon, faces exile, but Lysanias' early training was as an artisan and he feels a kinship with the workers. Soon he finds himself helping a new leader, Perikles, and facing a threat to his own life. 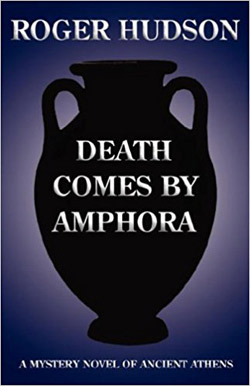 The planned sequel to Death Comes by Amphora is provisionally titled Fraud Under the Akropolis though that may have to change as fraud is proving not to be the major crime in town. But it is proceeding very slowly. The construction boom is a big player and the legal challenge to Lysanias’ inheritance with Sindron getting serious about achieving his freedom and Philia asserting herself too with Aspasia’s support. New characters real and imaginary have forced themselves onto the scene not to mention Lysanias' first and very unusual battle and the first performance of the Oresteia - just to give myself a small challenge! Fear of invasion from Sparta or Persia hangs over Athens as the new government of radical democrats seek to consolidate their power against the resentful aristocrats now led by Kallias, the city’s richest citizen. Lysanias, completing his military training on border patrol, stumbles upon a night-time intruder who escapes, wounding Lysanias’ colleague Niarkhos. Thinking the wound not serious, Lysanias is horrified when told next morning that his friend has died and his body been sent back to the city for burial. He decides to check this out as soon as he can. On leave to fight off the challenge to his inheritance of his uncle’s estate in the law courts from his cousin Hierokles, Lysanias and his slave Sindron, who successfully investigated the murder of that uncle in No. 1, are asked by Perikles, leader of the radicals, to go undercover to investigate the accidents and deaths that have been disrupting completion of the Long Walls, which will provide secure defence against invasion. They also threaten the re-building of the harbour town of Peiraeios by the innovative and eccentric town planner Hippodamos. They rapidly find themselves embroiled in a complex network of suspects and spies with different possible motives and some of them willing to stop at nothing to achieve their objectives. "a truly original and amazing book"
"an excellent book, entertaining and instructive." "a definite winner...nothing short of amazing"
"Roger Hudson is certainly an author to keep your eye on." "a corking good detective story...highly enjoyable read!" "a worthy entrant into the historical mystery genre." "a pretty good read with likeable characters"
"characters compelling, conspiracies well tangled." 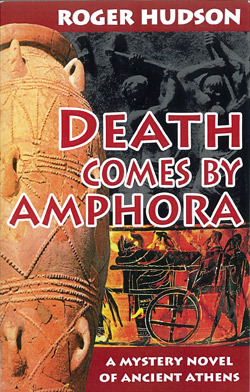 Death Comes by Amphora - Book Trailer from Stoney Road Films on Vimeo.